فیلمین سناریو یازاری, فیلم یؤنئتمنی, کومدین, فیلم یاپیمجی‌سی, موسیقی‌چی و اوْیونچو. 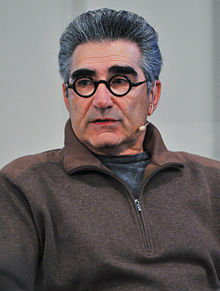 یوجین لوی (اینگیلیسجه: Eugene Levy) کانادالی فیلمین سناریو یازاری, فیلم یؤنئتمنی, کومدین, فیلم یاپیمجی‌سی, موسیقی‌چی و اوْیونچو. ۱۷ دسامبر ۱۹۴۶ ‏ ایلینده دۆنیایا گؤز آچیب. 1969–گۆنوموز ایللر آراسیندا سینما ساحه‌سینده چالیشیب. 1985 George Burns Comedy Week Robert Episode: "Home for Dinner"
1987 The Disney Sunday Movie Tom Lynch Episode: "Bride of Boogedy"
1988 The Ray Bradbury Theater Bert Harris Episode: "Skeleton"
1992 Camp Candy Unnamed character (voice) Episode: "When It Rains... It Snows"
1993 Maniac Mansion Doc Ellis Episode: "Freddie Had a Little Lamb"
1996 Road to Avonlea Rudy Blaine Episode: "King of the Great White Way"
1998 Mad About You Doctor Episode: "Nat & Arley"
1998 Hercules King Midas (voice) Episode: "Hercules and the Golden Touch"
1998 The Drew Carey Show Dr. Rider Episode: "The Engagement"
1999 The Wonderful World of Disney Larry Episode: "Dogmatic"
2000 Dilbert Plug Guard (voice) Episode: "The Return"
2014 Working the Engels Arthur Horowitz Episode: "Meet Irene Horowitz"
2015 R40 Live Rockin' Mel - Host/Emcee of early 1970s era spoofed rock show. Video used as an introduction for the band's encore, which consisted of early career material dating to that era. اینگیلیسجه ویکی‌پدیاسی‌نین ایشلدنلری طرفیندن یارانمیش«Eugene Levy»، مقاله‌سیندن گؤتورولوبدور. ( ۲۲ ژانویه ۲۰۱۸ تاریخینده یوْخلانیلیبدیر). قارداش پروژه‌لرده یوجین لوی گؤره داها آرتیق بیلگی‌لر تاپابیلرسینیز.